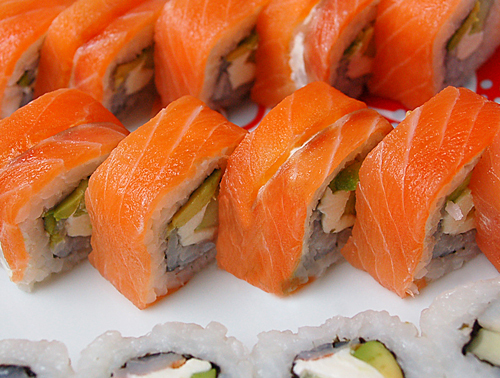 Salmon-Zushi is very popular in Japan. Salmon-Zushi had been served in only Sushi-restaurant in Japan. And we had few chance to have meal in Sushi restaurant. It was very hard to have meal in Sushi-resaurant for people who earn regular salary. By little and little ,We had lost passion for Salmon-Zushi , however we love to eat Salmon-Zushi. Later , It was very shocking news that Salmon-Zushi was served in izakaya. From that point , we can enjoy Salmon-Zushi lightly in izakaya at any time. Now , we can eat Salmon-Zushi in more than half of izakayas. I hope you enjoy Salmon-Zushi in Japanese izakaya. Have you ever tried smoked salmon temari zushi? It’s the same type of sushi but just rolled into a ball.